I want a weekend do over, it just went by way to fast!!! 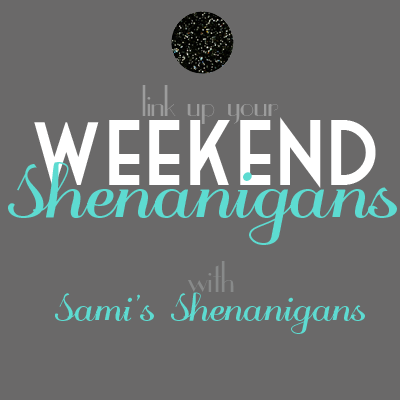 Linking up with Sami for my weekend Shananigans, per the usual. Friday night we went and saw Steve-O at the comedy club. It was pretty awesome. Everyone was really funny and Chris and I had a great time. I didn’t realize that he was 39. Sort of crazy to think about. I guess some people never really mature and move on from high school. I could not believe the amount of pretentiousness in one concentrate area. It made me sick, actually. Why are we having my boat is bigger than your boat contests at the age of 50? Are we that insecure with ourselves still and stuck on materialistic things? Pretty sad if you ask me. Either way, Chris and I had fun laughing at the ridiculousness and watching the games! Sunday we woke up and headed to Waffle House for breakfast..yum yum yum! Their bacon, egg and cheese Texas melts really are to die for. I don’t care how many calories is in it, I just skip lunch! Afterwards we got some stuff to care for our lawn, as it is looking a little sad. When we got home, I cleaned and meal planned for the week while Chris treated the lawn. We got caught up on a few of our shows as well, which I love having some down time! Now it is time to tackle this week! I hope you all had a wonderful weekend. Bring it, Monday! Also linking up with the Monday Mingling. I miss traveling to the south for the Waffle House alone! I agree that the weekends always go by so fast! Sounds like you had a good one though! But sadly Monday arrived and back to work 🙁 I’m just stopping by from the linkup!